qPCR plastic consumables | Tamar Laboratory Supplies LTD.
Our FrameStar® two-component technology reduces evaporation from PCR plates, improving your results and allowing you to reduce the volume of expensive reagents to save you money. FrameStar® plates combine the advantages of thin-walled polypropylene tubes for optimum PCR results, with a rigid polycarbonate frame to increase the thermal stability of the plate during the PCR process. This means that compared to a standard polypropylene plate, the FrameStar® plate will not warp and expand during rapid heating and cooling, meaning the integrity of seals will remain consistent and therefore less of your sample will evaporate. This in turn means you can spend less money on expensive reagents, as you are retaining more during the PCR process. FrameStar® PCR plates maximise thermal stability at high temperatures, which prevents sample loss by minimising thermal expansion during PCR. The two-component design combines the advantages of thin wall polypropylene tubes for optimum PCR results, and a rigid polycarbonate skirt and deck for the highest thermal stability and rigidity. 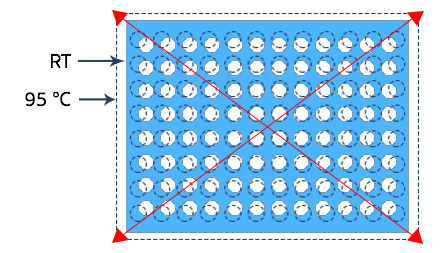 In contrast to standard one-piece PCR plates, evaporation from the corner positions of the plate and outer rows of wells is minimal, which allows for the downscaling of reagent volumes and therefore saves costs. Two-component technology reduces thermal expansion and sample evaporation. Reduction of evaporation leads to improved consistency of PCR results. Well spacing and position post-PCR remain accurate so liquid handling devices can reliably add or remove the smallest quantities from the plate. Ideal for robotics, as plate distortion is eliminated post-PCR. FrameStar® is ideal for assay miniaturisation due to rigid skirt eliminating warping, giving better sealing properties. Cost saving due to downscaling of reaction volumes. Lack of warpage reduces variation of fluorescent signals in optical assays, such as qPCR. PP is the optimum material for PCR tubes. It provides the most efficient heat transfer, as well as an inert surface with low binding capabilities for nucleic acids, proteins and other molecules. However, the material is not thermally stable in a plate format, and expands and contracts during each PCR cycle. Such thermal expansion will weaken the plate seal and leads to sample evaporation mainly from corner wells and outer rows.